Jon "Bones" Jones is one of the biggest names in UFC. One of the most dominant fighters in mixed martial arts, he's also the type that fans either love or love to hate. No matter the case, he's easily one of the largest draws that people pay to see. At the same end, Jon Jones cards rank among the most sought after in the sport as well. 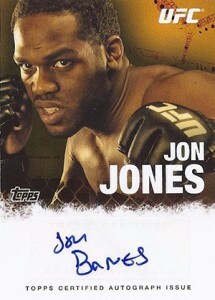 Shop for Jon "Bones" Jones cards on eBay. Thus far, Jones' only UFC loss came as a result of a disqualification. He sprung to the forefront of UFC when he won the Light Heavyweight Championship in March, 2011. When he did, Jones was just 23-years old. He became the youngest UFC champion in the organization's history. Since winning the belt, Jones has defended against some impressive names, including Rashad Evans and Quinton "Rampage" Jackson. There is no shortage of Jon Jones cards for collectors to chase. When you factor in the parallels, there are literally hundreds of different options despite the relatively limited number of MMA trading card products. 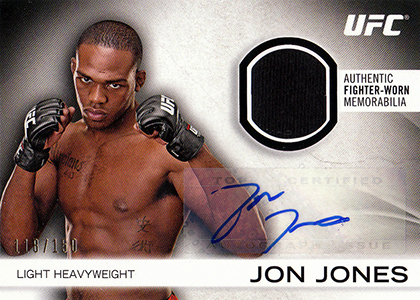 The most popular Jon Jones cards include autographs. Prices range greatly, though. Some are available for less than $50 while some of the rarest have sold for more than $1,500. 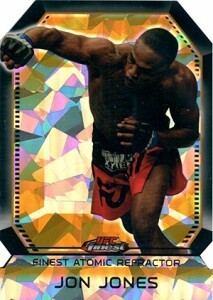 Below is a list of ten of the best and most interesting Jon Jones cards available to collectors. While most of these are valuable, that isn't the primary consideration. The most valuable Jon Jones cards are, for the most part, the rarest ones that there are only a couple of copies of. We limited this list to cards that are plentiful enough that collectors should be able to find and buy, even if it takes a little bit of searching. 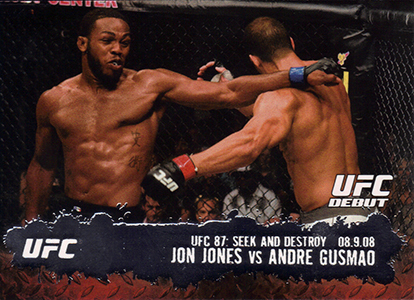 Consider the 2009 Topps UFC Jon Jones his rookie card.It features the future champ in his first UFC bout, which came against Andre Gusmao. It doesn't cost a ton, but commands a premium over most other base cards simply because it's his first. 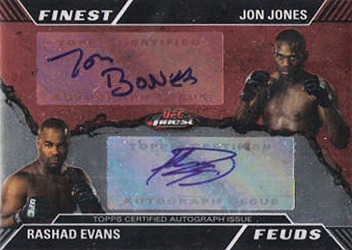 If you're going to pick up a Jon "Bones" Jones autograph card, this is probably the one to get. It's got a good case of the "firsties," offering card collectors their initial opportunity to get a certified signature from the fighter. The base version comes without a serial number. Several parallels offer a more limited take. A Red Ink version numbered 14/25, sold for just under $1,600 in February, 2013. The signature is also inscribed with his nickname. 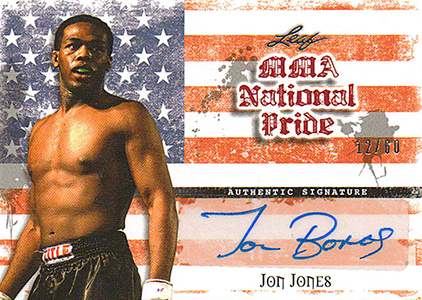 Although there are rarer cards, this Red Ink autograph has long been considered the ultimate Jon Jones card. 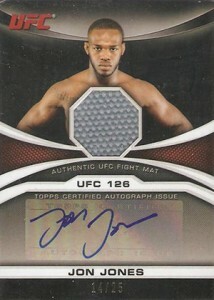 Most Jon Jones cards come from Topps UFC products. However, the light heavyweight had a handful in Leaf's first MMA set. Numbered to 60, the stars and stripes of the American flag make for a strong backdrop. 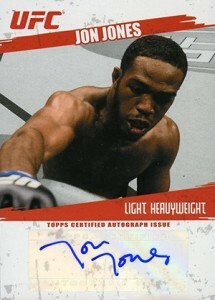 Another early Topps Jon Jones autograph, this card has a much more memorable look than his 2009 Topps UFC signature card. The photo is intense and dramatic, capturing the spirit of a fighter getting ready for battle. The basic version has no confirmed print run, but there are four numbered parallels. 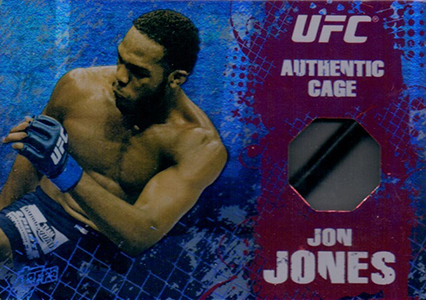 There is no shortage of Jon Jones relic cards to chase. But this one's a little different. Rather than a piece of fighter-worn shirt or mat piece, both of which are easy to find, it has a piece of the Octagon cage embedded in it. Combine that with the foil finish and you've got a card that stands out, even if it doesn't cost a ton. This doesn't rank as one of the most valuable Jon Jones cards, but it's one of the most visually striking (pun only intended if you want it to). Besides a great action shot, the card comes die-cut to a shape resembling the Octagon. The speckled background completes the trifecta of what makes this card worth getting, even if it doesn't make you rich. Jon Jones and Rashad Evans are two of the biggest names in UFC. Both entered their UFC 145 fight with just one loss apiece. The pair also used to be teammates. Not surprisingly, their match came with a ton of excitement. Jones was the victor by a unanimous decision. This card is important because it captures one of the bigger rivalries for each fighter. Numbered to 25, it is fairly tough to find. Although Jones and Anderson Silva have yet to fight against each other, it's one potential dream bout that many are hoping for. If and when it does come to fruition, it could easily be one of the biggest in UFC history. 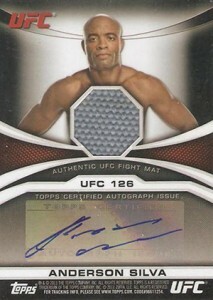 This dual-sided card has autographs from both fighters. In the center is a piece of the mat used in UFC 126. Jones and Silva were both on the card and both were victorious. Dana White is one of the most visible authority figures in sports. He's a key part in the marketing of the promotion, getting his face -- and his frank thoughts -- out there. This card includes autographs from both the UFC President and Jones. It can be seen as a reminder for the very public verbal sparring following the cancellation of UFC 151, which some blame Jones for. He was supposed to face Dan Henderson. When Henderson was injured just days before the fight, Chael Sonnen was going to be a replacement but Jones refused on such short notice. Without a marquee main event, White opted to cancel the show entirely. Jones and White exchanged comments through the media in the fallout, but they eventually made up. With its relatively sizable print run, this is one of the more affordable autographed memorabilia cards featuring Jones. The simple but balanced design makes it an attractive one as well. Besides the basic version, there are parallels numbered to 88, 8 and 1.